An Element Of Fun For Everyone! This section is full of creative, fun, and free games that can be adapted to any theme. Since most of the games could work for any theme, you might find just what you need in any of the categories. When choosing your games, keep in mind the personality of the mommy-to-be and the age ranges of your guests. Select games that will complement the theme and type of guests you are hosting. If you need a little help planning your games, read our Secret Hostess Game Tips Guide. The daring games would require some animated people to give them personality. You can use written games to help stifle awkward conversation. Icebreaker activities get everyone warmed up and ready to play. Keep the games moving! Game lag can sour a fun baby shower quickly. Mix it up! A good selection of written and active games can help to make your baby shower well rounded. If you do not know the guests, choose a few different kinds of games so you have some to fall back on if you realize others will not work. Just a dash of creative twisting and you will have the perfect fit you need to make any baby shower a success! What Are Your Favorite Baby Shower Games? Found a great game to play at a baby shower? We would love to hear about it!! Share your game ideas with us and we will feature your ideas on its own page for everyone to read. Have a question about how a game is played or are looking for something that is not corny... You can also ask questions about a baby shower game. Our readers love to help each other with baby shower questions! 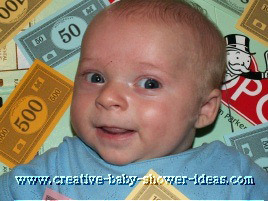 Baby Taboo- I created a Baby Taboo version of the Taboo game for my friend's baby shower. She is a HUGE fan of the game! Winner Takes All Baby Shower Game- A fun game that we used to collect money to go towards the mom was "the winner takes all game". What Kind of Prizes Do You Give?- I have a question to ask...What kind of prizes or gifts do you give to the winner of the games? Find the Pin Game- You take mini clothes pins and mix them together in a bowl of uncooked rice. This game was really tricky! The Mommy Memory Game- This is another version of the traditional memory game played at baby showers. This one is all about the mom-to-be. Sock Folding Game-How quickly can your guests match up socks? We played this game to see who the laundry pro was out of our guests! Lapel Baby Game- A simple door prize game for the guests. We gave a baby lapel to each guest as they arrived. On the back of each one there was a number. Change The Baby Race- This is a great game for a co-ed event! Test the skills of the guests (and future parents) on how quickly they can change a diaper.